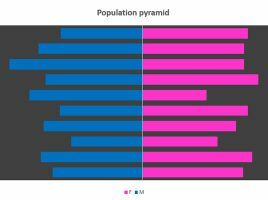 Population pyramid is a subclass of the Bar chart chart that is conenient when we need to show results of the research in which we compare two populations. Most often we compare the percentage representation. 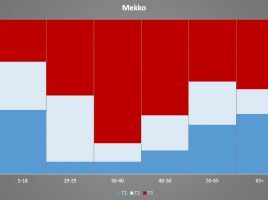 These can be answers, in relation to the age, how many survey members responded with the “YES” and how many with “NO”, we can compare the number of men and women which belong to a certain population, etc. Excel 2019 comes with two new types of graphic object,; these are 3D models and icons. 3D models are vector models of objects that we can add from the location on the disk or the Internet, and serve to better illustrate the data in the table. For example, if table contains a work order 3D model may be the product design we make. 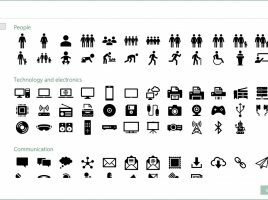 Icons are 2D graphic objects (SVG) that we can use in a similar way. 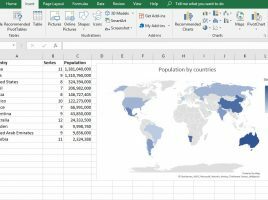 Excel 2019 has got a new type of maps that we can use to illustrate the data from the spreadsheets we’ve made. Actually, this is just another chart that we can add from Insert ribbon or after launching the Recommended Charts option. It allows us to create filled maps, where each country from the given dataset is filled by a color according to given values. The Funnel chart is not a great novelty. In one of the earlier posts there were words about how to graphically represent the sales funnel, and what’s new is that this chart, that previously existed only in Office365 and Office Online editions, became part of Excel 2019. 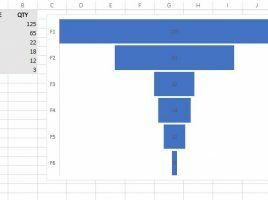 The Funnel chart is most useful when we want to display values ​​(quantities, amounts) in relation to a certain business phase, and how to do it will be shown in the following scenario.